The Financial Services sector is a fast-paced, dynamic industry, faced with increasingly complex regulations, market pressures, and constant change – particularly in terms of customer demands and preferences. Moreover, financial organizations are often subject to mergers, acquisitions and vast restructuring, which can disrupt productivity levels and the efficient day-to-day running of operations. In order to meet the changing needs of customers, while ensuring efficient business continuity, financial institutions need to deliver transparent, cost effective services that will not only increase their reputation among their customer base, but also allow their staff to spend more time in developing strong, long-lasting customer relations. Here is where Ricoh can help. As a global company specializing in document management, office imaging, IT services and production printing, Ricoh is able to provide integrated end-to-end financial solutions that add customer value, while delivering significant cost savings and efficiency gains. Financial institutions have complex information flows. Inbound documents, which can include paper-based mortgage applications and insurance claims as well as web generated enquiries and account applications, must be recorded and processed securely within an auditable workflow. At the same time, outbound customer communication, which can incorporate information collated from different internal databases, has to be optimized and communicated effectively across a variety of platforms, including email, SMS and post. If the information workflows are not managed effectively, time can be wasted, tying up valuable internal resource and delaying customer engagement. Use of ineffective systems and technology can also add cost to the operation. Ricoh helps generate cost savings for financial institutions by ensuring customers receive the right information, at the right time, in the right format. Moreover, Ricoh Managed Document Services consultants also identify opportunities across the business not only to outsource processes, but to also optimize them, including the reduction of unnecessary print which ultimately leads to efficiency gains and cost savings. Customers expect relevant, detailed and timely communication from their financial services providers. As a financial services organization, to engage the customer, build brand loyalty and cross-sell additional services, your customer communication needs to be colourful, personalised and targeted. Ricoh identifies key processes that can be outsourced and/or streamlined, in addition to delivering solutions that minimize time spent on administrative tasks, allowing staff to spend more time interacting with customers, ultimately improving overall customer communication and their experience. Many existing office document processes are manual. A lack of consistent data management means that documents forwarded manually to a central office or processing facility can easily be misfiled, compromizing compliance. Ricoh provides solutions that ensure all technology is integrated to avoid data leaks, ensure confidentiality and compliance with data security regulations. Moreover, Ricoh can help organizations maximize their security levels with awareness campaigns, technology certifications, client advice and fully managed document services. 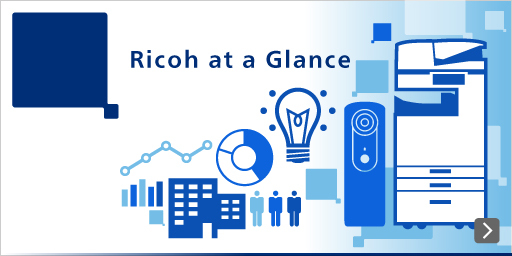 To learn more about Ricoh’s Financial Services offering, please visit following pages.